The Changdeokgung Palace Complex is the oldest of Seoul's Royal Palaces. It dates from 1405, and is still very well preserved. For the Chosun Dynasty (1392-1910) it served as the main palace for over 300 years. Attached to the palace is the "Secret Garden", a beautiful landscape garden to be used by the Royal Family only. You can find especially imported trees, pavillions, pagodas, stone bridges and ponds. 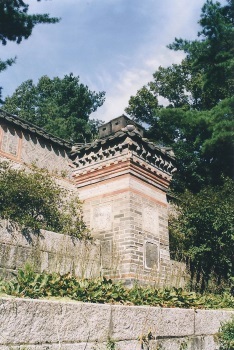 One of the buildings in the palace complex still has the old blue tiles, that once were common in Korea. Now Changdeokgung is the only place in Seoul where you still can see this. To be able to take a look inside I had to take part in a guided tour. Normally not my cup of tea, because the time is so limited and other people always get in the way of your pictures. That proved to be the case also this time, but I wouldn't have missed Changdeokung itself. What I liked most - apart from the scenery - was the ondol, the heating system. 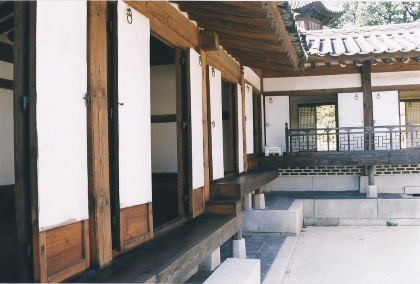 Traditionally, Korean houses were heated by generating heat under their floors. This system can be seen clearly at Changdeokgung, and it comes with two delicately pretty chimneys too. I visited this site in late 2007. The Changdeok Palace sits in central Seoul and is an intact, impressive former seat of the Korean monarchy. Unfortunately, the palace seems rather sterile because all of the artifacts and furnishings have been removed. It is a collection of mostly empty buildings. Unlike most World Heritage sites, you can’t just buy a ticket and stroll about the grounds. You have to be with a tour guide, and tours leave about every hour/half hour in different languages. Tours last about an hour. This, along with the nearby Jongmyo Shrine are the easiest world heritage sites to visit in Seoul. Read more about the Changdeokgung Palace Complex on my website. I visited this WHS in April 2017. Having visited all South Korea's WHS, I believe this is one of South Korea's highlights and truly possesses OUV. Changdeokgung Palace can be visited freely without any tours everyday except Mondays (closed). On the other hand, the Rear/Secret Garden can only be visited with a 90 minute guided tour and can either be booked online in advance (recommended about 2 weeks before visit) or try your luck booking in person on the day. I chose an afternoon visit as there seemed to be more people booked on the morning visits. I was lucky to visit on a lovely day during Cherry Blossom season. The tour guide gave quite an interesting tour without enough time for photos or for roaming freely whenever the tour was getting a bit boring. Another worthwhile possibility worth keeping in mind are the night time visits. I bought the combined palaces ticket which also includes entry to the Jongmyo Shrine and the Rear Garden. Chang means prosperity and Deok means virtue. An inscription in the royal palace states that "Only through cultivation of virtue, should prosperity be attained" (referred to the king himself). 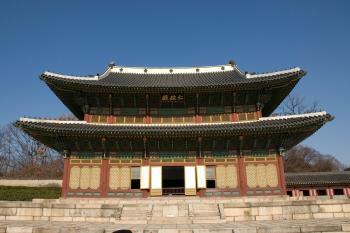 The palace complex was the preferred palace of many kings in the Joseon dynasty. 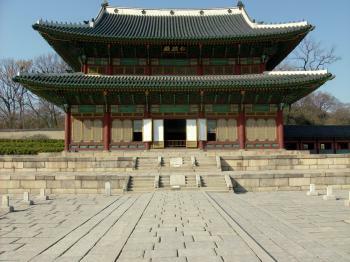 It served as the centre of administration for state affairs and as royal residence longer than any other palace in Korea. It was built in 1405 but it was burnt down during the Japanese invasion of Korea in 1592 like all other Korean palaces. However it was the first palace to be reconstructed soon after in 1610. Its most distinctive feature is its layout which embraces the natural topography in a narrow space at the foot of a mountain. The most impressive building is most probably Injeongjeon (the throne hall) which can be seen in Kyle's picture. The Geumcheongyo bridge bears some striking similarities with China's Forbidden Palace bridges. My personal favourite is the Seongjeonggak building (photo) with an apt signboard reading Bochunjeong which means Pavilion of the Announcement of Spring. This is where the crown prince studied Confucian classics. Another striking building is the Nakseonjae complex which is less colourful and used to be used as a library and living quarters. Here it's easy to appreciate the floor heating system as well as the different patterns adorning the firewalls. All in all, I really enjoyed my visit combined with a morning visit of Gyeokgungbung Palace. The UNESCO inscription plaque is just next to the exit and is quite easy to spot just after finishing the rear garden tour. The Changdeokgung Palace is the finest example of Korean art and architecture. The building of this palace started in 1405 and was completed in 1412. 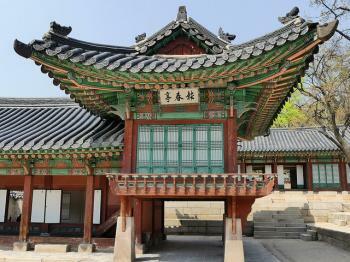 It was used by many kings of the Joseon dynasty that added some elements to the original complex. The palace was completely destroyed by the Japanese and was rebuilt in 1609. Hit once again by Chinese, French and American, the complex has kept its original shape and plans. Today, 13 royal buildings are still in place in the complex as well as many others for servants the gardens. The place is very amazing and is a great testimony of the Korean know-how in term of buildings, paintings and architecture, all that in balance with nature. Palaces and me are not the greatest mix, as such I focused my visit here on the picturesque Biwon/ Huwon (Secret Garden) at the rear of the complex. I visited in autumn and the dazzling array of colours in the bright sunshine really made this a lovely place to stroll around and take an inordinate amount of pictures. I really enjoyed just sitting and relaxing next to the small pavilions overlooking the ponds and valleys that litter the gardens, reading a book and taking in the amazing foliage. Access to the Gardens was by guided tour but it was pretty relaxed and if you wanted to just slink off it didn't seem to cause any problems. Thankfully the powers that be seem to have removed the need to visit the palace only on a guided tour, and now you are free to wander at your leisure. It was rather nice, reminding me of the structures I had seen at the Forbidden City the week before, but here the atmosphere was a little more tranquil. All in all this was a nice place to spend a few slow hours admiring the wonderful trees, and as there is another WHS just across the road it makes a good place to get your fill of the royal roots of Seoul. I visited this beautiful palace on 3 separate occasions in 2008. The palace is exquisite, and each time not only was the tour slightly different, with different guides and during a different season, but also on some occasions the tour goes to other locations inside the palace! So I am very happy I went a couple times. Changdeokgung is one historic site that suffers a bit from misinformation or at least quick judgement. One being too much restoration or lack of authenticity. Second, the garden is dismissed as forest-like with a couple pavilions and a pond. The later I will address more below. The authenticity questions is fair, yet its also complex. Changdeokgung is the best preserved royal palace in Seoul and much of the layout is intact. This cannot be said for Gyeongbokgung or Deoksugung, which are vastly smaller today and only a handful of structures from the Joseon period remain. It is true the majority of buildings at Changdeokgung Palace are restorations, though it should be understood approximately 1 in 3 are original to the rebuilt palace in the 1600's or from later periods of the Joseon Dynasty. Sadly, the Colonial Period put most Korean historic sites in a dire situation, the palaces (symbols of the dynasty and the nation) were purposely and publicly demoted and some might say "polluted". It was not random chance the adjacent palace from Changdeokgung was turned into a zoo. 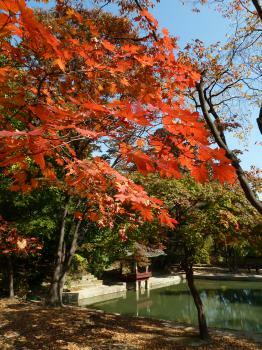 Therefore, the relatively intact survival of Changdeokgung Palace Complex is exceptional. The secret garden displays uniquely Korean aesthetics. One being the restraint to not disturb nature's beauty. How can humans improve it? Therefore, the underlying theme of Korean gardens with man-made pavilions, paths, and ponds is to allow the individual to better view nature and its beauty, not control it or artificially create beauty. Essentially, traditional Korean gardens are unforced, the design is in fact aimed to reflect simplicity. Confucian thought certainly has influenced Korean garden design and its seen here at Changdeokgung. i got to visit here a couple years ago. it was so beautiful. and i enjoyed the different types of entertainment. i'm going to South Korea again for my graduation present and i really want to vist the palace again. acutally i just remembered that all the shows were at the Korean Folk Village...which was cool too. but the palace was thee best. The guide tour was good but lack of freedom to walk around the palace. Walking inside the Secret Garden is very relax and comfortable. 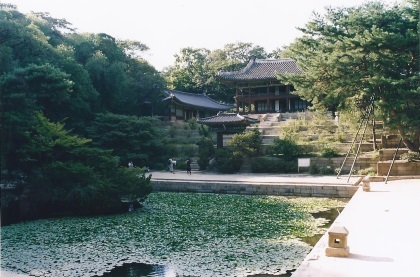 Toyotomi Hideyoshi: Changdeokgung Palace and Jongmyo Shrine were both razed during Hideyoshi's disastarous campaign to conquer Korea and China in the late 16th century. Both sites were rebuilt following the end of the Imjin War. Confucianism: The architectural style of Changdeokgung Palace, demonstrate features of simplicity and frugality, reflecting the Confucian ideology of the Joseon Dynasty. Built in the 15th century: In the early 15th century, the Emperor T'aejong ordered the construction of a new palace at an auspicious site. Built or owned by Japanese: In 1920 The Japanese regime destroyed parts of the complex and a Japanese building was constructed in the palace courtyard. 219 Community Members have visited.